For decades it’s been a popular destination for hippies, Europeans, and Israelis, especially during the winter, but now Goa seems to be opening up to package tourists and many others as the secret gets out. As you probably know, Goa is a small state in central India along its west coast, made up of a series of small beach towns and a few larger inland cities. One reason it’s becoming more popular is that Goa is ranked very highly on the cheapest cities in Asia list we recently discussed. Prices have been rising steadily as of late, but it’s still a fantastic bargain by almost anyone’s standards. Anyone staying longer than a week should easily save money compared to the Caribbean area, even if the flight is more expensive. Since Goa is a collection of towns it does tend to be different from one to the next. It’s generally divided into North Goa and South Goa, with the north being home to more of the popular tourist beach towns, and the south being more rural. It’s definitely worth noting that even many of the most famous towns in the north, like Vagator, Anjuna, and Chapora, all feel as spread out as national parks compared to the rest of India. 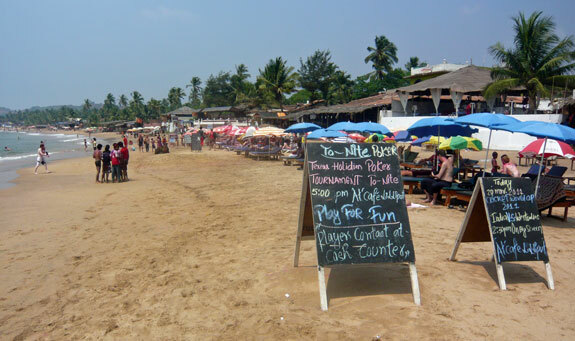 Most of the hippies and the trance-music fans go to Anjuna or Vagator, where there are nightly beach parties running from December through March. Foreign tourists dominate these towns to the point that virtually every sign is in English and all the locals speak it flawlessly. Just south of Anjuna you have the beaches of Baga, Calungute, and Candolim, which together form one long unbroken stretch of sand that goes on for many kilometers. This area isn’t as scenic as the rock and cliff-dotted area to its north, but it’s where you’ll find all the larger hotels, which are perfect for groups and package tourists. Further south you get smaller beaches and towns where tourists aren’t quite as common, though there are definitely clusters of tourist areas there as well. One surprising thing that every visitor will encounter is that not only is Goa mostly Catholic (it was run by the Portuguese up until about 1953), but it’s VERY catholic, at least visually. You’ll see portraits of and shrines to Jesus in most businesses, and the spring Carnival is perhaps the biggest holiday of the year. If you are heading to Goa it’s extremely important to consult your calendar first. From June through September you’ve got the famous monsoons, which bring amazing amounts of rainfall to the area. Very few tourists visit during this period, so if you do come you’ll be wet, and almost alone. During October and November the weather is much drier, yet the crowds haven’t arrived yet. Prices are still at their lowest levels so if you don’t mind having so few other people around, this is the best time to come. Starting just before Christmas, Goa is packed, mostly with Europeans and now a surprising number of Russians as well. The massive crowds are around through January, enjoying the best weather of the year. From February through early April Goa starts to empty out just a bit yet, even as high-season prices are still in affect at most places. The weather gets increasingly hotter and more humid, though it’s still far nicer than just about anywhere in Europe during the same months. April and May tend to be the months when Indian nationals come to Goa, since it’s still dry, and even though it’s very hot and humid in Goa, it’s much nicer than the inland areas that are even worse. Getting here may not be cheap, but once you arrive it’s easy to live on a very low budget. Very simple guest houses start at around US$5 per room, and paying more gets you a bit of luxury plus a better location. Rooms without air-conditioning at beach hotels are easy to find at under US$20 per night, even during the high season. If you go to the larger hotels in Calungute or Candolim you can find A/C rooms starting between US$30 and US$50 during high season. You can get a full meal (without drinks) for around US$2 if you need to, but for around US$5 you can get something very filling and special. A large bottle of Kingfisher beer will cost around US$2 at most places, even along the beach itself. Public transportation consists of ramshackle local buses for US$0.22 per ride, but most people rent a motorbike for around US$4 per day, or even less if you keep it for a week or so.